Our Managing Director, Peter McNamara, recently spent some time in Linz, Austria to visit with the partners that invented and supply us with Wearmax. Wearmax is a revolutionary and unique, high-tech ceramic floor sealer. It’s a highly effective floor coating, which gives protection against dirt and scratches, and renders floors slip-resistant – even in wet conditions. 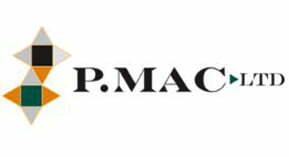 We a confident that Wearmax will become the go-to solution to many Facility and Property Managers here in Ireland. Wearmax floor coatings have been widely used in Austria for over 15 years now, and are known across Northern Europe and the US. A floor coated with the Wearmax system is highly resistant to staining, traffic wear and scratches. The floor’s maintenance costs are greatly reduced, as all that is required to keep them looking new is daily mopping with a pH neutral soap. No cyclical waxing or polishing is required. The Wearmax coating system comes with a guarantee of up to 10 years and is an ideal solution to revolutionise a tired floor coming to the end of its life. 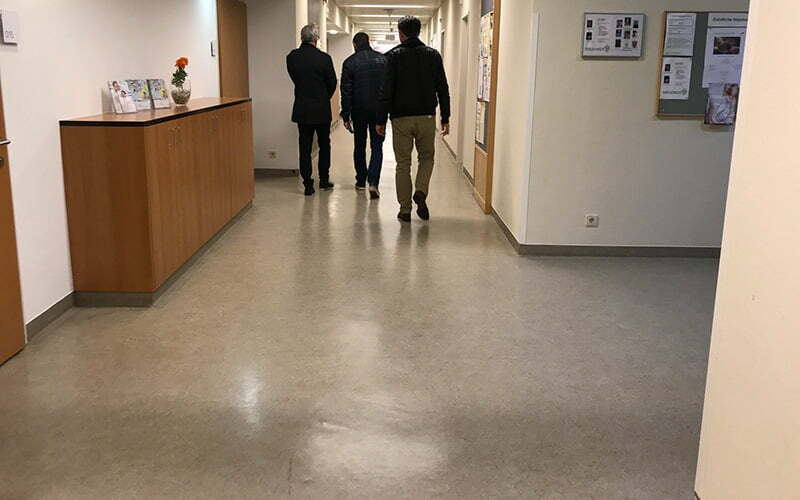 Wearmax is widely used in Europe on vinyl and wooden floors in hospitals, schools, sports halls and government buildings. 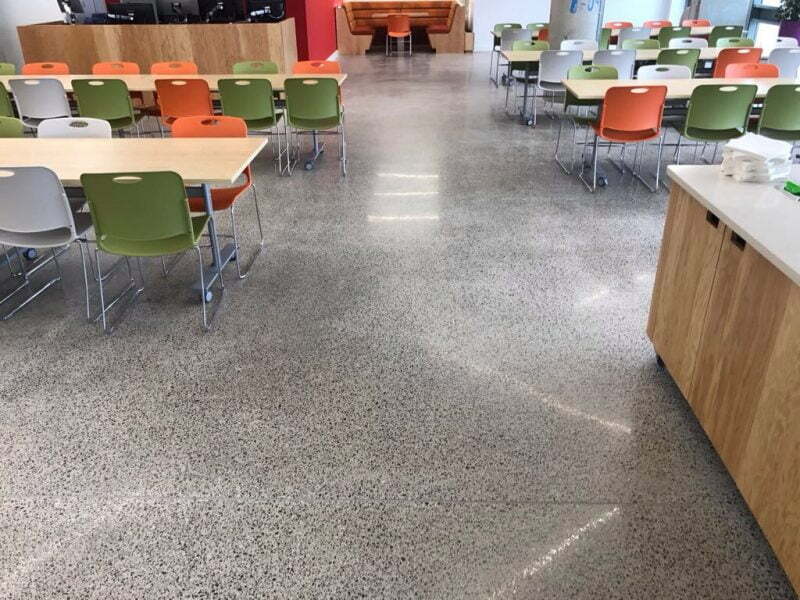 In Ireland, we have extended its use to give additional protection to polished concrete floors and render them slip-resistant in either wet or dry conditions. We are delighted to have been awarded the contract to treat all Luas trams with the Wearmax system. 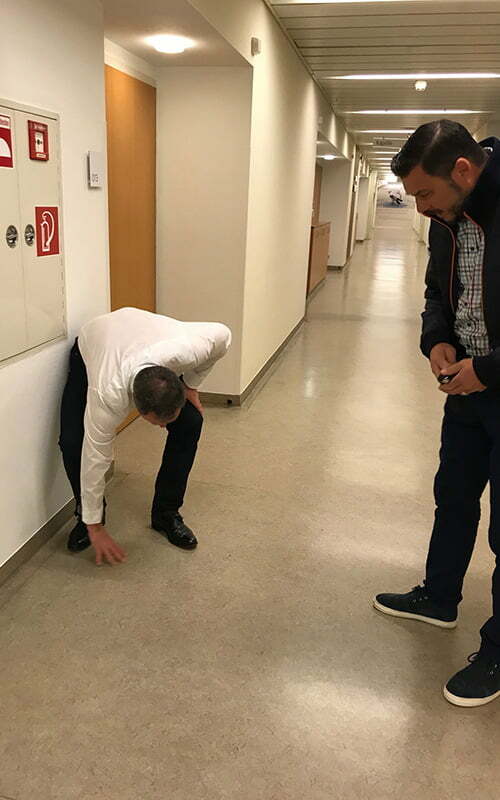 This trip to Austria highlighted the diverse ways Wearmax can help in high traffic areas, which become prone to stains, scratches and wear patterns. The trip was also used to discuss the further development of Wearmax, including the new generation of Wearmax UV. 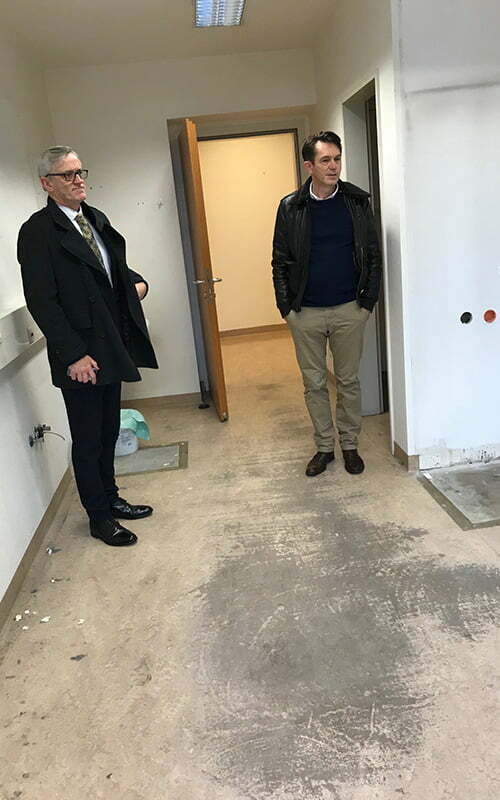 As veterans of the flooring industry here in Ireland, we are delighted to be able to contribute our knowledge and experience of various floor surfaces and problems to help with the development of this product. The first site visited was Diakonissen Hospital. Here we were shown a high traffic vinyl floor. The floor had been treated with Wearmax 12 years ago, but amazingly had not been restored since. 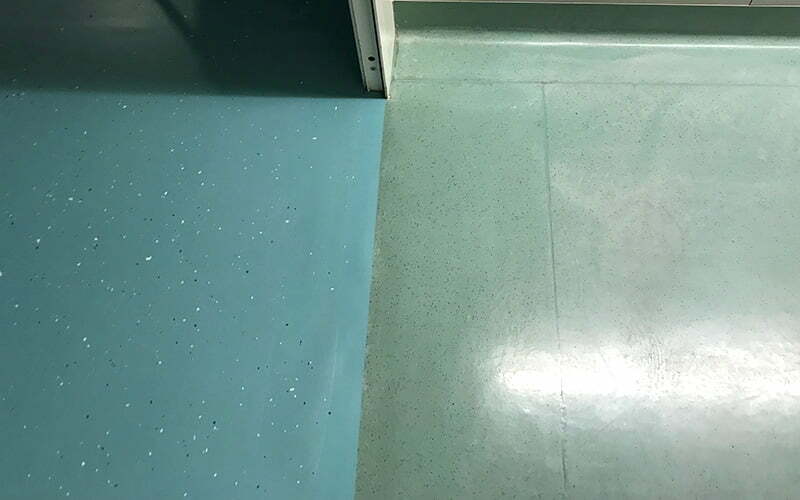 The area has only required minimum maintenance and as you can see from the images, the floor has remained in excellent condition – making Wearmax the perfect solution for organisations that are busy and cost conscious. The Wearmax application allows for greatly reduced maintenance requirements and reduced labour costs. Wearmax application on high traffic vinyl floor. It was applied 12 years ago and remains in perfect condition. The perfect solution for organisations that are both busy and cost conscious. Julian from Traffik UK, British distributor of Wearmax. On the second site, we were shown a floor that had not been treated with Wearmax. As you can see from the image, the stains and wear patterns are very visible. What makes this image interesting is if you look through the open door you can see how the wear marks stop in the hallway. 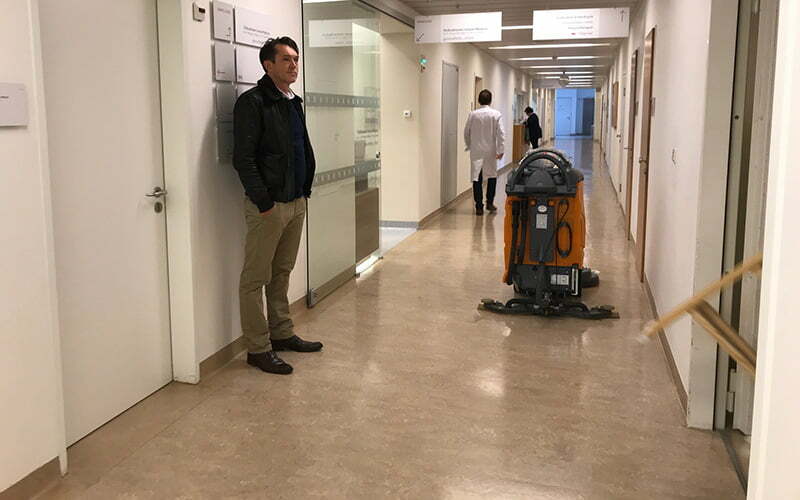 The hallway was treated with Wearmax and the difference in condition is very noticeable, the hallway has no wear marks despite being subject to the same volume of traffic. Howard (Managing Director) and Julian from Traffik UK. On the third and final site, we looked at a floor that had been in extremely bad condition. To renovate the floor, a number of Wearmax products were used. First, Wearmax colour was applied to enhance and dramatically change the look of the floor. Wearmax colour comes in a variety of RAL colours and can really transform a tired floor. This was followed by Wearmax Armour – the Wearmax Armour coat contains thousands of tiny ceramic particles which provides both abrasion and wear-resistance, as well as providing excellent traction giving the floor its super slip-resistant qualities. The floor was then sealed with the final coat Wearmax Shield. The Wearmax Shield gives the floor its glossy appearance and protects the Armour coating. It gives the floor excellent resistance to diluted acids and alkaline substances. The Shield coat permanently eliminates the lines and scratches, and conveniently becomes a part of the floor’s finish. Once dry, cleaning and maintenance time is significantly reduced, leaving your floor looking like new with half the effort. The work completely renovated the floor and gave it a brand new appearance. It was interesting to see the difference between the old floor and the Wearmax treated floor. This was an extremely cost-effective way to rejuvenate a tired floor at the end of its lifecycle. The Wearmax paint was finished with fleck and ceramic shield. Comparison between an old and new Wearmax-treated floor. The trip was a great educational experience and demonstrated the diverse ways of using Wearmax on a number of different floor types. Most importantly, it illustrated the durability of Wearmax, even in high traffic areas, and how it is an ideal solution for restoring a tired floor that one would normally replace. It is an extremely cost-effective solution as it avoids premature replacement of a damaged floor. It is a sustainable solution as there is no impact on landfill. Additional environmental benefits are that no chemicals or cyclical stripping and re-polishing are required to keep the floor looking good! Oh, and did we mention its slip resistant credentials? 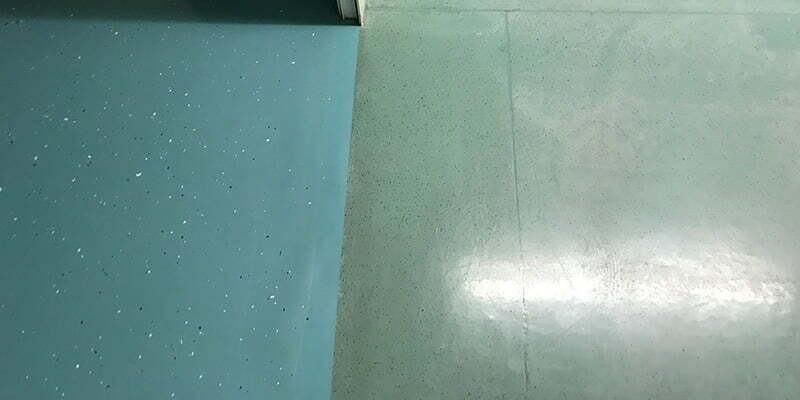 A floor coated with the Wearmax ceramic coating system gives you a slip coefficient of up to 47 in wet conditions, which is an extremely safe floor.